The Panama Canal has taken yet another step forward toward the completion of the Canal Expansion Program as it begins to fill the Cocoli’s locks, on the Pacific side, following a similar and successful endeavor on the Atlantic side earlier this month. This important step marks the start of a deliberate and methodical phase of compliance and operational testing for the project. 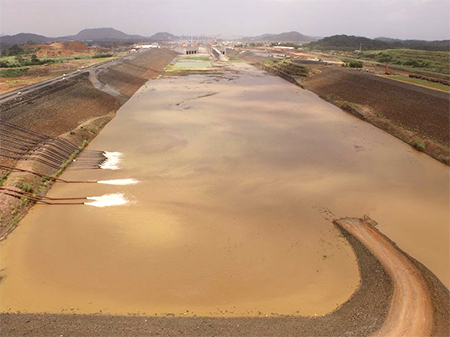 “Earlier this month, we reached one of the most important milestones of the program through the filling work of the Atlantic locks; now moving on to the Pacific side, we take great pride in the work done so far and are eager to bring the full program to completion“, said Panama Canal Administrator/CEO Jorge L. Quijano. The intricate filling process will make use of powerful electric and diesel pumps, designed specifically for the job. The electric pumps are expected to provide 30,000 gallons of water per minute each, while an added network of 13 diesel pumps will work to pump 7,000 gallons of water per minute each, filling the lower chamber at a rate of nine inches per hour. The filling and subsequent testing of the new Pacific locks is expected to take approximately 90 days to complete. Among their features, each lock complex includes three chambers, nine water-saving basins with a filling and emptying side system and rolling gates. As of the end of May, the overall Expansion Program of the Panama Canal stood at 89.8 percent complete.